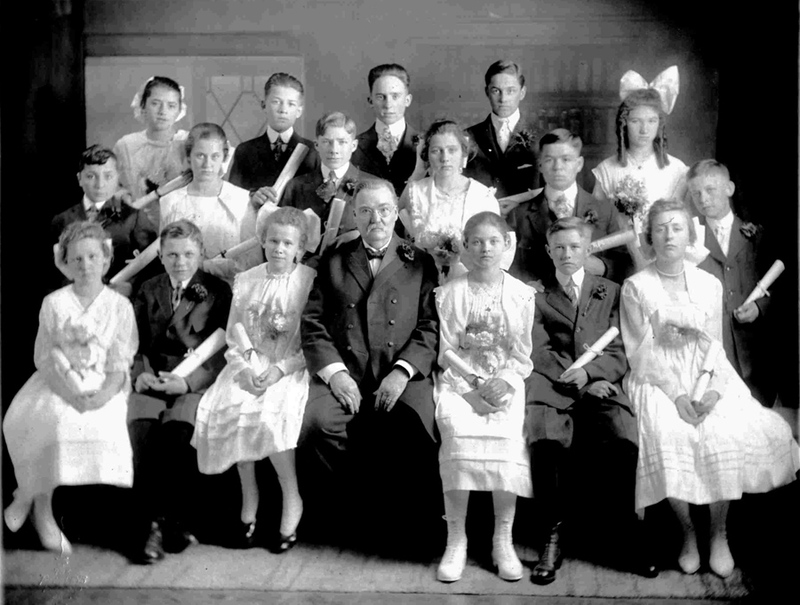 The Ebenezer German Congregational Church Confirmation Class of March 31, 1918. Front row from left to right: ?, ?, ?, Rev. F. A. Willman, ?, ?, ? Second row from left to right: ?, ?, ?, ?, ?, ? Unidentified class members include: Lena Miller, Paulina Helzer, Lily Miller, Marie Wolf, Emma Weigandt, Elisabeth Hinkel, Pauline Schiebelhut, William Schaefer, Henry Schwartz, Henry Helzer, Waldemar Stieben, Henry Weigandt, Henry Geo. Yost, Conrad H. Repp, Louis Sauer, John Leel (Lehl). Photograph courtesy of Gina Stephenson.